Feel free to send us a message if you have any questions! 1.1 How can you reach us? You can reach us on the phone at 778.478.4111 or by iMessage at info@alchemyliving.ca during business hours, or by e-mail at info@alchemykelowna.com anytime. We can also be reached by direct message on Instagram or personal message on Facebook @alchemylivinginc. 1.2 Why do you need my e-mail? When you place an order we will send you several e-mail's with information pertaining to your order such as: confirmation of purchase, confirmation of shipment, and a tracking number. We will not send you newsletters or other notifications unless you sign-up for them (either from the bottom of our site, or during checkout). At any point you can unsubscribe from these e-mails. 2.1 Are you on social media? Yes! We are @alchemylivinginc on Instagram and Alchemy Living Inc on Facebook and Pinterest. Give us a follow to keep up with new products and events. 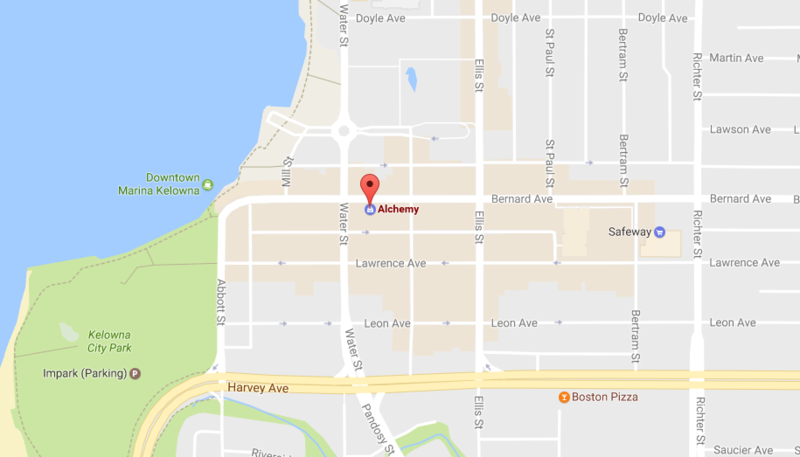 You can find our Brick-and-Mortar store at 345 Bernard Ave., Kelowna, B.C., Canada. Online we are at www.alchemylivinginc.com (but we are guessing you already know that). Our hours do change seasonally, so please check regularly to ensure that we are open. We use Paypal and Stripe in combination to process all of our payments as they are well known and trusted. Paypal can use your bank information directly, a debit card, or can process a Discovery card. For all other credit cards we use Stripe. For information on shipping and returns, please see our Shipping & Returns page, or click here. 5.1 Where do your things come from? We collect our vast offerings from the whole spectrum of manufacturing, whether it be small, local artisans or large international suppliers, we like to have a wide variety and we like to utilize companies that are Fair Trade or ethically responsible . For specifics on certain items the items description is a good place to start, but if more information is required feel free to send us an email. For information on benefits for designers, decorators, stylists, architects, etc., please see our Designer Program page, or click here.